I have to admit, I usually stay away from anything to do with trying saxophone necks or different brands of saxophones. So much of my time is already consumed with trying so many different saxophone mouthpieces that adding necks and saxophones to the mix is just too overwhelming for me. The reality is that changing the saxophone neck or the saxophone itself can dramatically change the sound and response of any mouthpiece. I learned that years ago when I bought a RS Berkeley tenor saxophone. It played great and I thought I could use it instead of my Selmer SBA tenor but I quickly found out that every mouthpiece I owned sounded and responded very different on the new horn. It was neither good nor bad but just different and it threw me for a loop. Ever since then, I have pretty much stayed away from other necks and horns because I know it would just confuse me and muddy the saxophone waters more for me. I have decided to make an exception though. You see, my Selmer Reference 54 alto saxophone is one of the early models that came with a first generation neck. When I tried it in the store, I fell in love. I had been looking for an alto sax for like 5 years but every one I tried just seemed mediocre to me. Selmers, Yamahas, Yanis, etc…….I tried a ton. The Reference 54 alto sax was the first alto I tried where I was immediately in love. I whipped out my credit card and bought it that same day. The one bad thing I noticed about it was that it had a gurgle in the low notes of the horn around low B and C. I didn’t think it was any big deal as I assumed it had a leak which is not uncommon with new horns unfortunately. That’s my long story, thanks for being patient. Now the point of all this is that when Jack Finucane from the Boston Sax Shop told me he had a new BSS Heritage alto sax neck that was amazing and asked if I would like to try it, I was curious. I doubted I would like the sound of it more than the original Reference 54 sax neck but maybe it would get rid of that annoying gurgle in the low end for me . 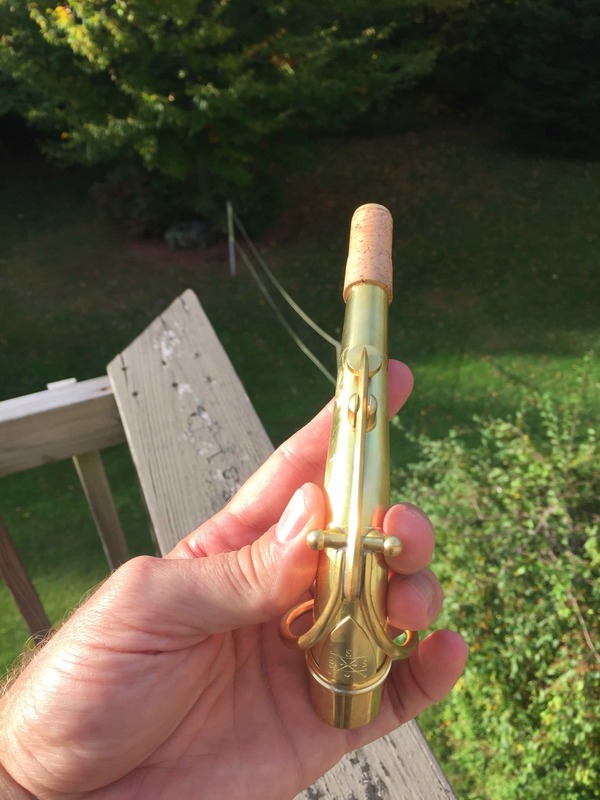 I told Jack I was interested and he was kind enough to send me a bare brass Heritage neck to tryout and perhaps review. The Heritage Saxophone neck was conceived from my twin passions; restoring vintage saxophones and playing them. I have had the privilege as a repairman to examine and test hundreds of vintage necks and put into the concept of the Heritage little pieces of my favorite attributes from each one that I found to be exceptional. A significant amount of influence for this neck comes from the free blowing characteristics I have found in earlier Selmers such as the Radio Improved and Balanced Action horns. 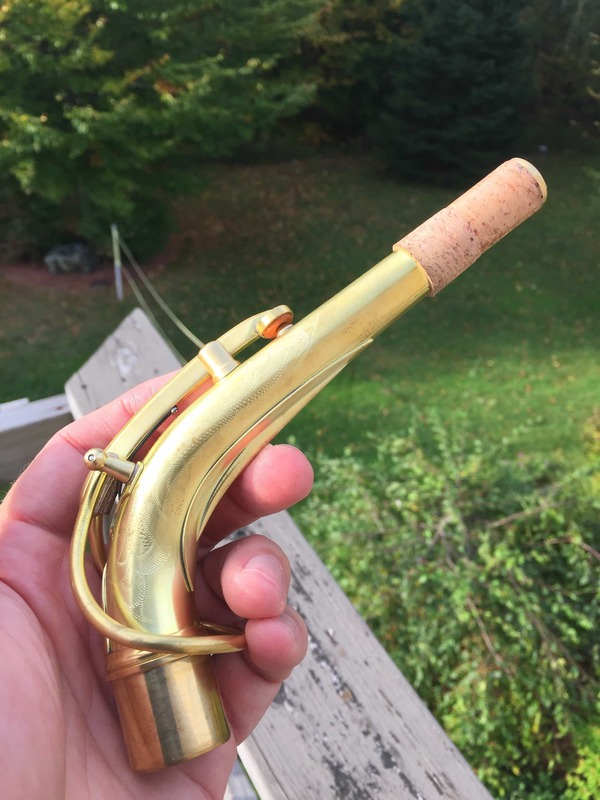 These models are getting harder and harder to find and often people prefer their sound but not their ergonomics, so I set out to produce a neck that would allow players to experience the magic of these older saxophones on more standard horns. After several years of measuring and many prototypes, the Heritage neck was born. The Heritage neck plays with more flexibility and has more width to the sound than a standard Mark VI or VI style neck without sacrificing control or pitch. I find it offers the player more room to push and opens up the middle register which is often more covered on alto, producing a more homogenous sound across the horn. It is my dream neck and I am proud to share it with you! The Bare Brass Heritage neck is made with a proprietary alloy sourced from Germany. Each neck will form its own naturally beautiful patina over time and handling. The Heritage neck is precision made to exacting tolerances to ensure consistency and hand engraved. Each neck includes a complimentary in house custom fitting to your horn. If you wish to order a neck to try at home please select your saxophone type and follow up by contacting me for additional fitting information. We have machined custom fitting dies that allow us to size any neck to the following models: All vintage Selmer models, All current production Selmer models, Yanagisawa, Yamaha, P. Mauriat, Cannonball, All other Taiwanese made saxophones. Jack custom fit this Heritage neck to fit my Selmer Reference 54 alto sax perfectly. He has the neck tenon measurements of most brands of saxophones in his shop so if you tell him what you have he can custom fit it for you also. I put the Heritage neck on my Reference 54 saxophone and played it. I have to be honest, at first, I didn’t like it. It seemed too different from my regular neck. It seemed more focused and not as fat sounding to me. As I played it and got used to it over the next week, I really started to warm up to it though. After a week, I went back to the regular 54 sax neck and I was surprised at how different it was. Now I didn’t like the original neck at all. It was too fat and spread sounding! This was confusing me! In the end, it is hard to say which neck is best or better but they are just different sounding and have a different resistance to them. Which one a player likes really has to do with the player’s personal preference. I know you want me to tell you which one is best but the best I can do is provide sound clips and tell you want I think of each neck so here goes……. Compared to the Heritage alto sax neck, the original Reference 54 alto saxophone neck has a fatter more spread sound to my ears. I thought the Reference neck was darker sounding than the Heritage neck but as I listen back to the recordings, I just think the Reference neck has a fatter more spread sound which tends to diffuse the brightness in the sound. I think the actual brightness is pretty similar and in fact I think the Reference 54 neck might actually be brighter. As far as playing on each neck, the Reference 54 neck seemed more free blowing to me and the Heritage neck seemed to have a little more resistance. Resistance always gets a bad rap though so I feel the need to explain. When playing the sax, there is good resistance and there is bad resistance. A bad resistance is when it is hard to blow and perhaps the tone sounds stuffy. 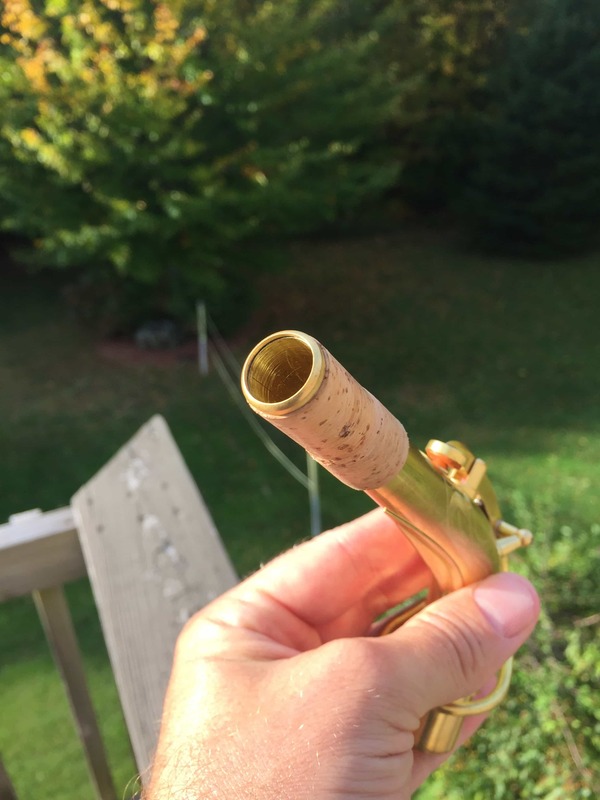 It is a lot of work to play a mouthpiece with bad resistance and it doesn’t respond like you would like. Good resistance is like the resistance you feel when you swim in a pool. It feels good. Moving your arms and feet against it has an effect. You feel in control and you can push against the resistance to do cool tricks in the water. Playing the saxophone with good resistance is similar, you can work with the sound and manipulate it easier than on a setup with little to no resistance. This was the case for the Heritage sax neck. It had a good healthy resistance. It seemed much easier to bend notes and manipulate the tone. I think the resistance and focus made vibrato easier and more effective on the Heritage saxophone neck also. I also felt like the range of the horn was more even and uniform than the original Selmer 54 sax neck. In clip 2 below I start with a few chromatic scales on each neck and I feel like the Heritage neck clip is more even and uniform in tone throughout the scale. Most importantly is that I did not get one gurgle on the new Heritage sax neck which is a major selling point for me! The intonation of both necks seemed pretty similar to me with slight differences. The second octave right hand notes like D,Eb,E and F were sharper with the original Reference neck. The Heritage neck was closer in-tune on those notes. The second octave left hand notes like G, A, B were a little bit sharper on the Heritage neck but I honestly think those notes are a little flat on the Reference 54 neck so I am used to having a pretty tight embouchure on those notes on the original neck to keep them up to pitch. This is easy to adjust for with the new Heritage neck though and just requires me to be a little bit more relaxed in that octave. The low notes were equally in-tune on both necks. The thing I have realized as I played the Heritage neck for the last few weeks is that I really dig it’s focused tone and vibrance (the tone seems alive and energetic). I always loved the fat spread tone of the original Selmer neck but now that I have been playing the Heritage neck for a few weeks and go back to the Selmer, the tone seems too fat and spread and I miss that focused core of energy to the sound. In the clips below I try to play similar lines and phrases. In Clip 1, I am playing the beginning of Phil Wood’s solo on “The Summer Knows”. On Clip 2, I play some slow chromatic scales, go into a short bluesy riff, play a little of Charlie Parker’s Yardbird Suite and then the beginning of Kim from the Omnibook. Listen to both clips and see if you can hear the differences between the two saxophone necks. 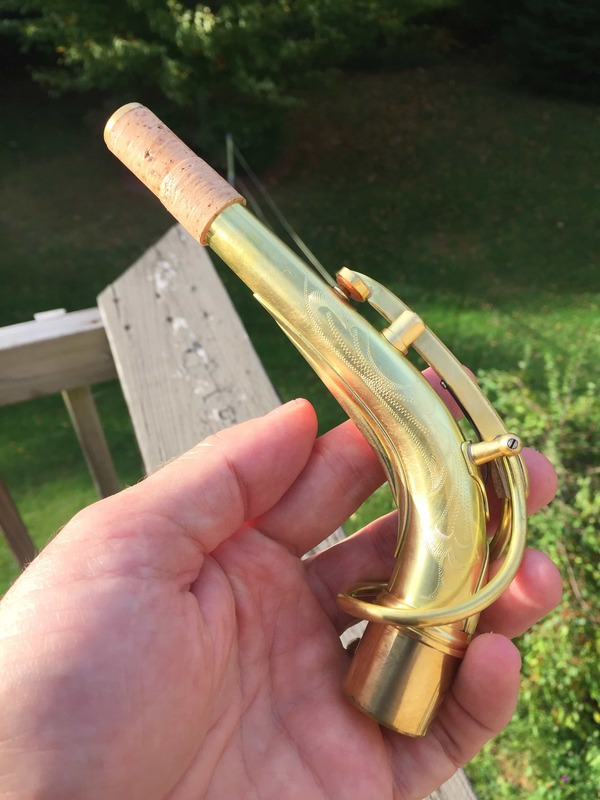 I think Jack Finucane over at Boston Sax Shop has done a great job with the Heritage alto saxophone neck. You can’t spend any time with Jack at his shop without seeing and hearing his incredible passion for all things having to do with the saxophone. He is very excited and always has new projects in the works. If you are interested in trying a new BSS Heritage alto saxophone neck you can find out more information on the Boston Sax Shop website. I own the Heritage neck for tenor, playing it on my 100K Mark VI. No comparison, the Heritage neck wins hands down. I really like what Jack is doing with these necks, they are somewhat less expensive than either the Kim Bock or Gloger necks, but what a difference it has made on my tenor. I hear very little difference! Hey Steve! Thanks for the great post! I am a fellow victim of the dreaded gurgle as well… I recently experimented with some new necks and found that it made a big difference. What changes did you hear with the Boston necks? I’ve heard lots of theories about what/why that happens from techs over the years, but it all seems to come down to the neck! I could hear a difference better in the last two recordings. And it seemed to me that the Heritage neck just sounded more pleasing to me. But I like a more “focused” sound on alto as well so maybe I’m biased here. I like vintage horns as much as anyone and I played on them for years and years. But because I like a more focused sound I found I got that easier on a modern sax. So yes the saxophone you play can make a difference or at least that’s what I found. Anyway that Heritage neck sounds like a keeper to me. I’ll play devil’s advocate here… I very much would like a video of how they do it, from a raw piece to final product. We always complaint about the chinese counterfeiting and stamping a recognized brand to mislead people, but also there’s the opposite, people getting mouthpieces and necks and horns from Asia, and branding them as the coolest boutique stuff. These BSS necks look way too similar to some of the necks on eBay going for 70 bucks, that btw, are very BA like in my opinion. Don’t kill the messenger. Google for yourself. Steve, as usual, thanks for your kindness replying, and of course for all the work (and TIME!!) you put into this website. Now that you said the word “manufacturer” it makes sense they have their own specs. Kudos to BSS then! Can’t find the neck I saw a while back on ebay, but look at what this guy have ebay.com/usr/dongfangleqi … I know, I know, they are most likely internally different, with BSS specs. Believe me I tried an Asian one that remind me a lot of the BA I had, from a student, and it cost him 60 bucks. I just want to see a something new once in a while, all these horns and parts looking ALL more or less the same, everyone outsourcing from Asia, same parts, just a tweak here and there, different finishes, and the almighty final touch (and logo stamp!) in the US. If we go back to the 50s you’ve got all the American horns VERY different from each other and all great (Martin, Conn, King, Buescher, etc. ), the French ones the same (Selmer, Buffet, etc. ), same with Germans, Japanese, etc. I guess it’s a bygone era, now it’s all copy and paste. Sorry for the ranty digression. Happy New Year! Steve, I’ve listened to both clips. Thanks for the extensive review! I myself am using a different neck on my tenor sax so I know it makes a huge difference. Talking about the clips. On the contrary I like the original neck the most. The new neck is in my ears more focused where the original neck is more spread with a beautiful tone in the upper register. It had the typical lyrical Selmer sound. The new neck sounds thinner in that area where it has the same timbre in the lower register. Perhaps it needs more playtime so that you can open up the sound in the higher register. As to the evenness. It is nice to have an even horn…however sometimes it is nice to lean on a particular dominant note and exploit it. I think it is harder to do so with an even playing horn. Might just be my two cents of course…. Hi Steve, the Boston seems to have ‘more bite’ and sounds more exciting. The original sounds a little dull. I guess the like mouthpieces, it’s all about taste.. I found the Boston to be more rounded and centered, the original neck is great, just brighter especially when you go low. On the Boston those low notes are kind of in the subtone territory, and I really liked it. There seems to be more warmth and character in the Boston. Both good, but if I could I’d pick up the Boston. Very nice sound either way, I think I prefer the reference, but mostly because I like the nice spread sound it has. I saw once a video of Timothy McAllister who discussed on how he tested saxophone neck: (here: https://www.youtube.com/watch?v=YzED4y58_9g ), and basically one of the test he does is to test how easy he can get overtones with Mouthpiece+neck. My wrong assumption that it wasn’t very important for alto and soprano as all neck were very similar, but of course I was wrong. Still, I think it matters even more for Tenor where you have even more parameters that can change from neck to neck. Wow! That’s very interesting. I never even heard of doing overtones on the neck. I’m gonna try that out later today and see if I can do that. You learn something everyday! Thanks! It may seem contradictory but, of clip 1, I prefer the original (the Boston too dark, not very flowing, and sounding too fine); of clip 2, perhaps, the Boston, more Parkerian and more focused; of course it is a matter of taste. And my opinion can be wrong. 2nd comment :). At Mr. Neff’s request, here is a comment I made on Sax-on-the-Web, I was mostly responding to another poster who was concerned with keeping the integrity of the horn intact. Personally, I’m more interested in the integrity of the music…. I have a tenor version of this neck and it’s just perfect. The issue with the original neck of my Mark VI is that the palm key notes tend to be a little weak and resistant feeling. The new neck makes it like it’s a complete horn, even sound and scale from bottom to top. Altissimo is easier too. The biggest difference between my (now gone) Mark VI alto and my current one, a 44K SBA, is this same even characteristic from bottom to top. On his website, Jack Finucane discusses measuring and analyzing a lot of necks, including the Super Balanced necks, and trying to make his Heritage neck emulate the characteristics of the SBA. For tenor, at least for me, he seems to have done it. The sound of the new neck is just a bit clearer and more responsive – not really different in any way, but like a veil has been lifted. I understand the idea of trying to keep a certain integrity to an instrument, but I don’t feel my new tenor neck has changed my horn or how it plays in any way, but just cleared a few muddy things up. It’s not one of those “Get a **KILLER** Sound With a KlangBoogey” deals, it’s just a better neck. An awful lot of very well-known musicians bought new necks from Selmer (and other places) to help their horns, so I don’t feel that it’s unjustified. 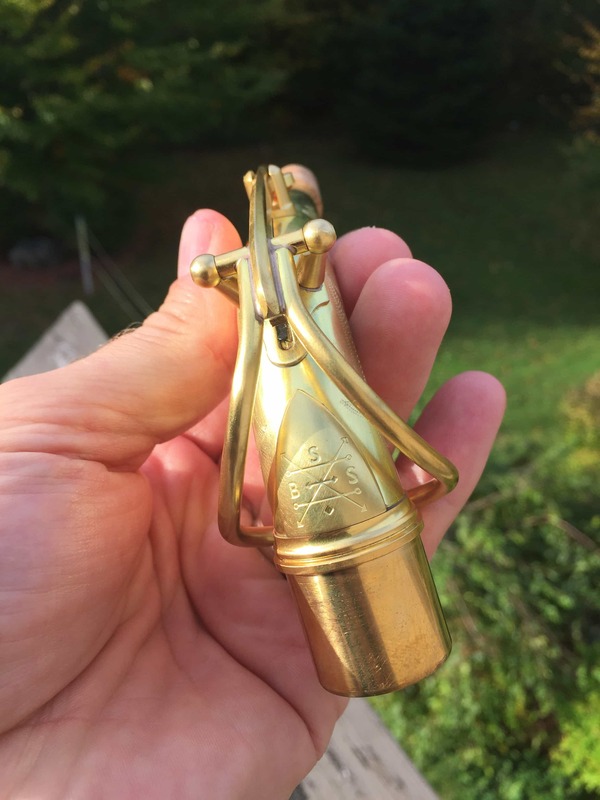 Steve, the “buzzy” nature of the mouthpiece choice for me overshadowed the qualities of either neck, although I did prefer the original Ref 54. Warmer, fuller & sweeter to me. Call me old fashioned but I much prefer your alto sound on the warmer sounding pieces such as the Gerber traditional, RR New York Bros, Ishimori Woodstone Med chamber & Morgan Fry. As you’ve observed, trying to improve the tuning vagaries of a horn with different necks, mouthpieces, ligatures etc. is a minefield. Best to start with a well intonated horn!